I’m always trying to think up new random acts of kindness ideas because they are such an easy way to make a positive difference. It’s fun to find new ways to spread joy to others! 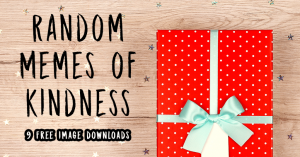 I hope you’ll find inspiration is the random acts of kindness ideas I share here on my site. I’ve gathered so many different ideas because I want to demonstrate how easy it is to lift someone else up no matter who or where you are. It only takes small acts and a pleasant attitude to make a really big impact on the world around us. 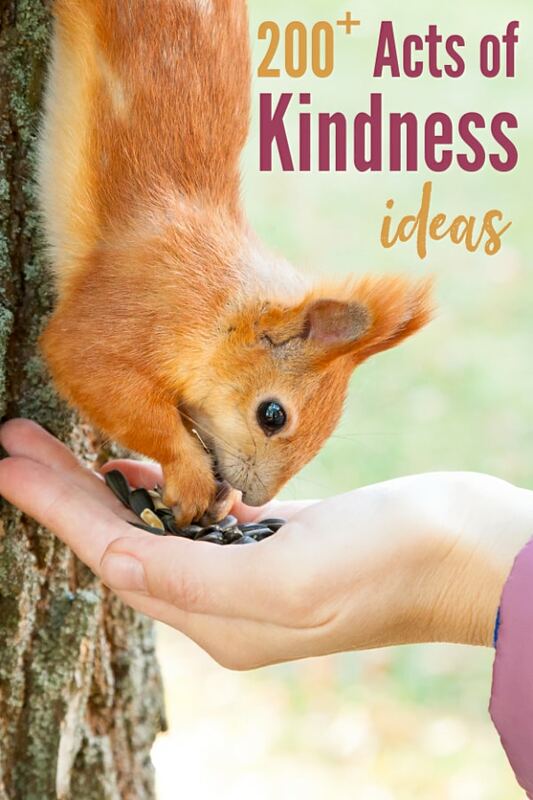 So please don’t think of the random acts of kindness ideas below as a bucket list, but instead as a spark to light the spirit of kindness and generosity that’s already within you. 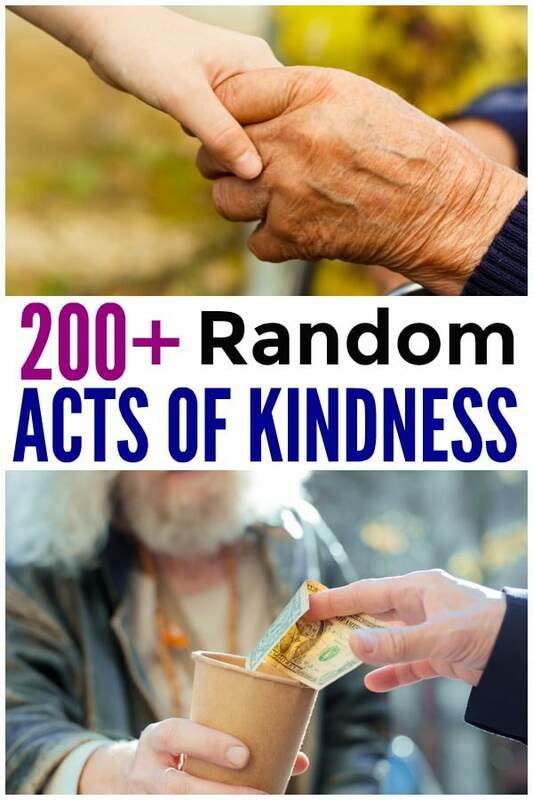 Below you’ll find links to dozens of posts with a total of hundreds of random acts of kindness ideas. 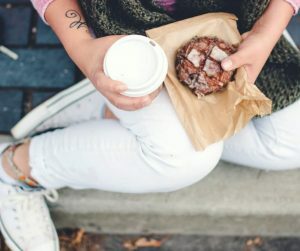 A simple list of ideas to inspire you when you want to spread some joy to others. 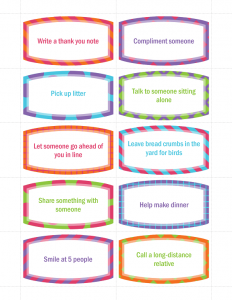 Printable cards to give to your children to provide them with easy ways to help others no matter how young or small they are. We often extend our kindness to others, but it’s important to remember to model kindness at home and to show those closest to us how important they are. These ideas are ideal for showing kindness to your spouse. 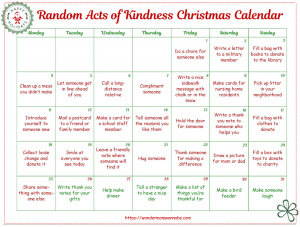 A kindness advent calendar filled with activities kids can do on their own! Plus a blank version so you can create your own and other variations to make it easier to incorporate this tradition into your own family. Make your holiday giving count by giving meaningful gifts. 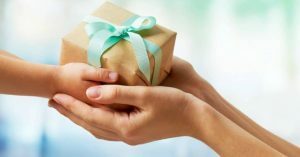 Here are 14 purposeful gift ideas that can truly make a difference in others’ lives. Random acts of kindness don’t just transform the life of the recipient, they help the person performing the acts too! 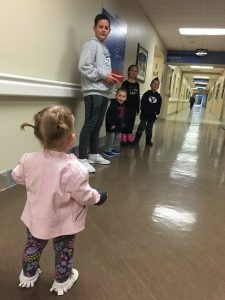 Inspiring your children to be kind is a great parenting tool and this post helps you learn how and when to use it. One of the best ways for kids to realize the power of kindness is to practice it themselves and see the results. School is the perfect place to practice and the lunch note reminders are an easy way for you to encourage your child to do it. Even very young children can perform random acts of kindness for others. These ideas are perfect for preschoolers! Many of us have brought a meal to a new neighbor or a friend in need. Sometimes, this act can unintentionally be a burden on the recipient! 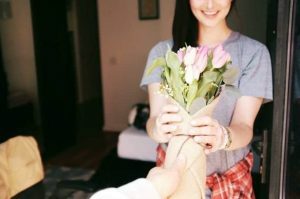 Read these tips to make sure that this wonderful act of kindness is truly a benefit to the recipient. 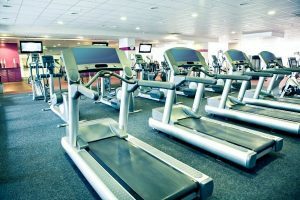 If the gym is part of your normal routine, you’re going to love this simple, but really clever idea for performing acts of kindness there. You can benefit others’ emotional health while you improve your physical health! Just like school is the ideal place for kids to practice kindness, your workplace is an ideal place for you to perform acts of kindness since you spend so much time there. These ideas are all easy ways to spread some joy at work. We all know that teachers sacrifice a lot for the benefit of our children. 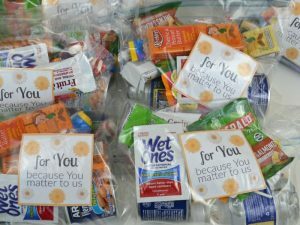 These are wonderful ideas to ease teachers’ daily burden and let them know they’re appreciated. This is a beautiful family tradition for helping the homeless. 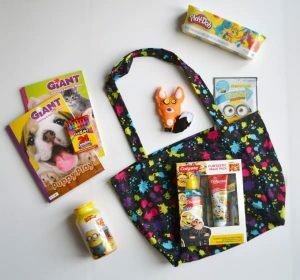 Lots of suggestions for items to include, plus free printable notes to attach to the bags. The elderly in our society are often left on the sidelines, even though they are our connection to our history and full of wisdom and experience. 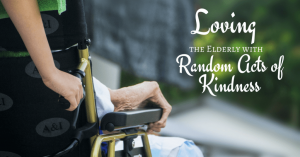 You’ll love these ideas for showing kindness to this important, cherished population. 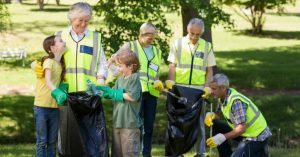 Make kindness part of who you are by integrating it into your daily family life with some of these suggestions. 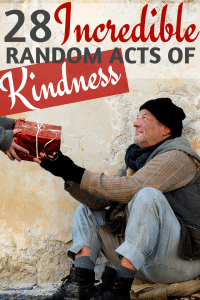 There are dozens of ways listed in many different areas so it’s easy to find acts of kindness that fit your way of life. Parenting is often the most challenging when your children are still small because they need so much from you. 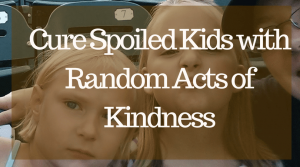 These random acts of kindness can make a BIG difference in the life of a mom with little kids! 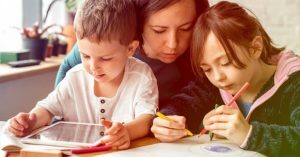 Many people have misperceptions about homeschooling and as a result, homeschool moms face unique burdens. 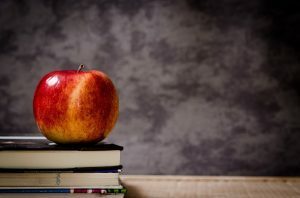 This is a must-read for everyone to understand what homeschool moms experience, with practical suggestions of how you can help support them. Moms make a lot of sacrifices for their families. 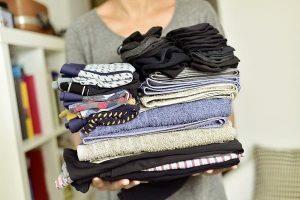 This list is full of ways you can brighten a mom’s day to give back to the women who do so much for others. As a photographer, Erin views life through a unique lens. 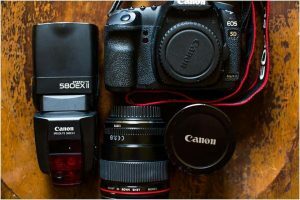 She shares some of the most impactful ways to use a camera to help others (and you don’t need to be a professional photographer to do them). These printable quote cards are the perfect way to brighten someone’s day. Just print them off, cut them out, and give them to people when you think they could use some inspiration. This beautiful tradition not only brings the family closer together, it makes a real difference in the lives of others! This is another fun family tradition, especially for those who love their local library. 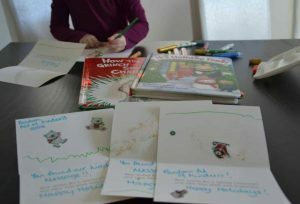 These hidden library letters will surprise and delight other library patrons for months as they are slowly discovered! Often, we think of doing random acts of kindness for strangers. But kindness goes a long way in improving the lives of the people closest to you too! 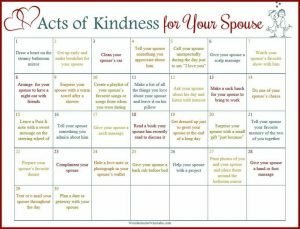 Here are some easy ways to be kind to your husband, including some free printable coupons to surprise him with. If you’re a coffee lover, you know how much coffee lovers appreciate any coffee gift. 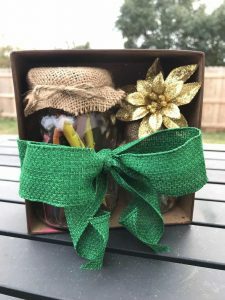 Here are three simple DIY coffee gift ideas you can randomly surprise a fellow coffee lover with. The best random acts of kindness are those that we perform without thinking because they’re just part of who we are. Here are some ideas of things you can do very naturally to spread joy and kindness. Improve your home life AND the lives of others at the same time! 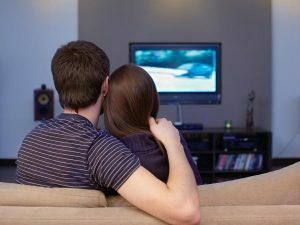 Before you purge, read this article. Make your charitable gifts more meaningful. I show you how and give you an example my daughter and I worked on together. 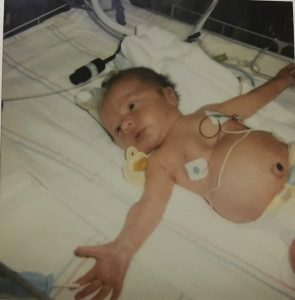 Parents of special needs children face unique challenges every day. 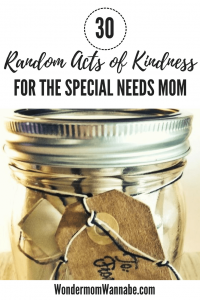 Here are 30 different ways to extend kindness to those moms who need a little extra dose sometimes. 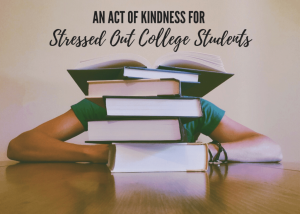 Living on your own for the first time, juggling several courses, having multiple deadlines looming – college students carry a lot of stress and one random act of kindness can be exactly what they need to make it through the rest of the semester. 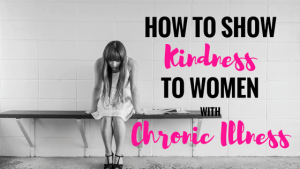 Thousands of women suffer from chronic illness and the only thing worse than the pain is the lack of compassion and understanding of it, especially since their ailments aren’t always obvious to others. These acts of kindness based on the five love languages are the perfect way to support these women who suffer so much each day. Learn all about Hospitality House, how it helps others, and what you can do to support it so it can continue to make a difference in the lives of those in need. 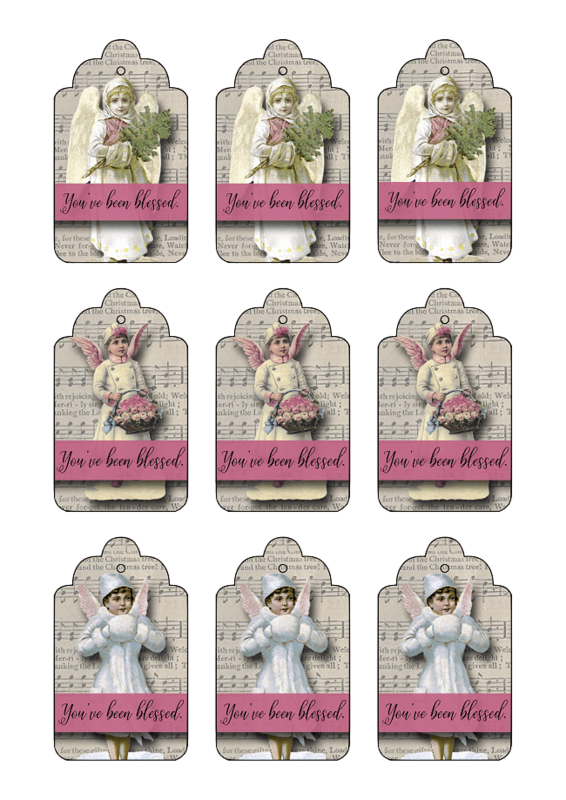 Here are some free “You’ve Been Blessed” gift tags to attach to random acts of kindness gifts (created by the very talented Sher Bailey). Just click the image below to open the file to save/print. 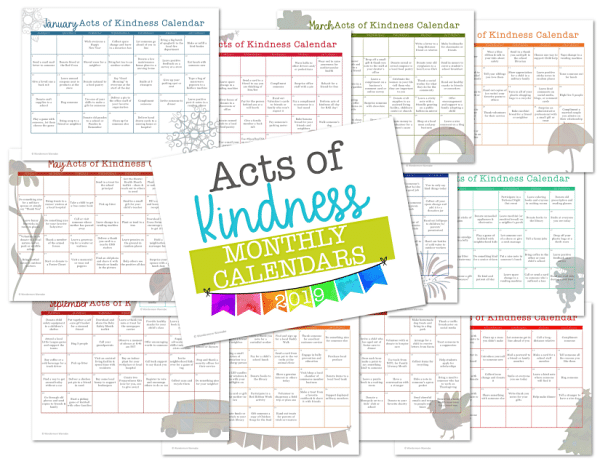 Get an entire year’s worth of ideas with these 2019 Monthly Acts of Kindness Calendars. 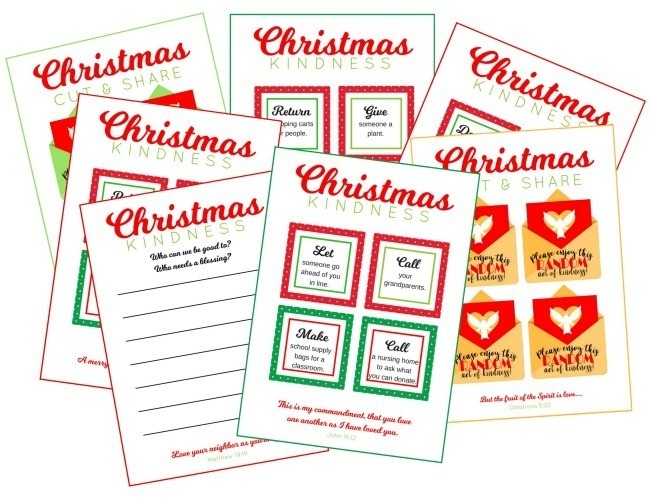 And I love these Kindness Kits from Renegade Made. There are 4 different kits that are perfect for kids. 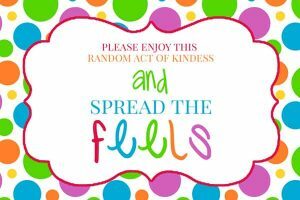 Such a great way to teach kids how fun and rewarding it can be to perform random acts of kindness for others! Also, check out these books on Amazon for even MORE random acts of kindness ideas.